All in One Music Systems. Cardas Custom Adaptors & Cable. CD, DVD Cleaning & Care. Vinyl LP Display & Storage. Music CD's & SACD's. Pro-Ject Tube Box S2 MM/MC Phono Stage (Black). Pro-ject Tube Box S2 MM & MC Phono Stage. Widely compatible with MM and MC cartridges Comes with two replacable ECC83 tubes Dual mono circuitry for optimized channel separation. 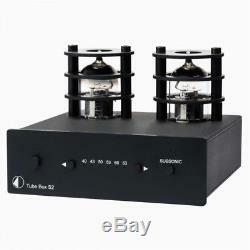 The Tube Box S2 is a premium phono stage for both Moving Magnet (MM) and Moving Coil (MC) cartridges. In order to achieve the best sound possible, it's become Pro-Ject's first product to feature a discrete circuit design without any operational amplifiers (op-amps). The Tube Box S2 delivers a relaxed audio performance with lush mids in a full and enveloping sound stage, just like far more expensive pure-valve phono stages are capable of. Thanks to the built-in adjustable gain, capacitance, impedance and subsonic filter settings, it's possible to tune the device to perfectly complement almost any modern MM or MC cartridge. It's also possible to tune the sound further, as the Tube Box S2 is Pro-Ject's first ever product designed for the valves to be replacable - allowing for tube rolling or sound shaping. The new S2 casing is a big additional asset to the design, as not only does it deliver the highest visual appeal, but it is also sturdy enough to protect the internal circuitry against unwanted interferences and vibrations, which can cause unpleasant listening experiences. The Tube Box S2 also benefits from protective cages around the valves - inspired by the superior Tube Box DS2 design. Inspired by high-end designs but available for a very appealing price, the Tube Box S2 is a real audiophile bargain. Valve phono stage Suitable for MM and MC cartridges Precise RIAA equalisation in two parts, passive/active Supplied with 2 x ECC83 valves Gold-plated RCA in and outputs Front-sided Subsonic filter button Front-sided Gain control Adjustable impedance and capacitance settings Dual mono circuitry for optimized channel separation Ultra low noise circuitry with FET input stage Premium S2 chassis Available in black or silver. 10 / 100 / 470 / 1k / 2k, fix 47k. 50pF / 150pF / 270pF / 370pF / 490pF / 590pF. 40dB / 43dB / 50dB / 60dB / 63dB. +/- 0,4dB/20Hz - 20kHz. 103 x 37 x 119mm. Cardas PCC ER Cartridge Clips. Milty Zerostat 3 Anti Static Gun for Vinyl Records LPs DVDs CDs. Analogue Studio Leather Turntable Platter Mat (Black). Audio Technica ATN91 Stylus Replacement. Tonar Pure Cork Turntable Platter Mat. The item you receive is different to that ordered. OR the item you receive is damaged or faulty. Please let us know before hand why you are planning on sending an item back to us and remember to include this information in your return. Pro-Ject (Project) Rolling Stones Special Edition Turntable - White. Pro-Ject (Project)'Measure It 2' Digital Stylus Force Tracking Gauge. Pro-Ject (Project) Coloured Felt Turntable Platter Mat (Light Grey) - 12. Pro-Ject VC-S Replacement Vacuum Arm Adhesive Strips. Sign up to hear about latest news & offers. The item "Pro-Ject Tube Box S2 MM/MC Phono Stage (Black)" is in sale since Friday, November 3, 2017. This item is in the category "Sound & Vision\Home Audio & HiFi Separates\Amplifiers & Pre-Amps". The seller is "chord2425" and is located in GB. This item can be shipped to United Kingdom, Austria, Belgium, Bulgaria, Croatia, Cyprus, Czech republic, Denmark, Estonia, Finland, France, Germany, Greece, Hungary, Ireland, Italy, Latvia, Lithuania, Luxembourg, Malta, Netherlands, Poland, Portugal, Romania, Slovakia, Slovenia, Spain, Sweden, Australia, United States, Canada, Brazil, Japan, New Zealand, China, Israel, Hong Kong, Norway, Indonesia, Malaysia, Mexico, Singapore, South Korea, Switzerland, Taiwan, Thailand, Chile.